The General Mobile DSTL1 ($450, unlocked; price as of November 16, 2009) has some nice features, like dual-SIM card support, but I found that the device's awkward design and unresponsive touchscreen dulled the sense of feature-richness and the ease of use that the Android OS can give a mobile device. The biggest selling point of the DSTL1 phone is that it can support two separate wireless phone numbers. You simply insert two SIM cards into the two slots below the battery. There's also a slot to accommodate a microSD storage card with a capacity of up to 16GB. The phone itself has 4GB of internal memory. 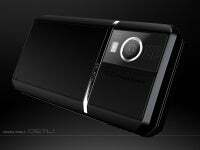 The DSTL1 runs Android 1.5 OS (not the newer Android 2.0) and carries a 624MHz processor inside. General Mobile went to Sharp Electronics for the 3-inch 240-by-400-pixel touchscreen display and to Sony for the 5-megapixel camera. The DSTL1 has an FM radio on board and offers Bluetooth 2.0 and Wi-Fi support. These specs look good on paper, but the phone's construction felt cheap. I didn't like the phone's highly reflective plastic chrome outer shell--because I would rather see the phone‘s features and content than my own reflection. The DSTL1 has a navigation wheel with an Enter button in the middle, plus buttons for making a call from either SIM card. General Mobile also provides an on/off button and an extremely useful back button. Measuring 4.4 by 2.1 by 0.6 inches, the phone is nearly as thick as the Motorola Droid, yet it lacks a slide-out QWERTY keyboard. As a result, you have to rely on the native Android touch keyboard for your typing, which is painfully small and awkward to use in portrait orientation, and far from comfortable in landscape mode. All of this might not matter much if the touchscreen worked well, but it doesn't. The screen appears to be imbedded a few millimeters deep in the phone's clear plastic shell; in any event, the touchscreen had trouble responding immediately and accurately to my commands in connection with everything from selecting apps to customizing the desktop to using the calculator. Meanwhile, the voice commands, such as 'open calendar', seemed to work well. One of the DSTL1's biggest shortcomings is its lack of 3G support--it can run only on 2G or 2.5G EDGE networks. I tested the phone with SIM cards from T-Mobile and AT&T inside. The voice calls I made on those EDGE networks were clear and uninterrupted by latency or drops. When I surfed the Net, the phone behaved torpidly and ran at very un-3G-like speeds. (My Palm Pre, in contrast, loads pages pretty briskly with the help of Sprint's 3G Network). The DSTL1 does benefit from Google's Android OS straightforward and intuitive interface. As I moved from task to task, the OS's basic tools appeared roughly where I expected them to be. Like other Android phones, the DSTL1 gives you three homescreens for installing your own set of shortcuts, widgets, folders, and wallpapers. A Google search bar appears at the top of the center panel. To move between the three homescreens, you swipe your fingers from side-to-side. Similarly, you bring up your application launch menu by swiping a tab up from the bottom of the screen. Preloaded on the phone are some 20 apps, shortcuts, games, widgets, and other tools--from the phone's settings to contacts to the FM radio. To install a shortcut to any of these "apps" on your front screen, simply press and hold the icon. General Mobile didn't attempt to build a layer of additional software on top of Android, as the manufacturers of some other phones did with varying degrees of success. Within a few minutes I successfully connected the DSTL1 to my Gmail account and began sending and responding to e-mail. Navigation through the messages was easy and intuitive, though typing in the 'compose' box was slow going because of the touchscreen. The phone's text messaging functions were similarly well organized and intuitive. Once you've typed your message, you choose which SIM card to use to send your message. Importing my contacts from Gmail was easy; using the phone to create new contacts was a little more time-consuming. The Android address book adopts a tabular design, which simplifies the tasks of locating and accessing various contact details. When you click a contact, the app displays all of the available modes for contacting the person (text, phone, IM, and so on). If you use one SIM for work and the other for personal activity, keeping the two separate is easy. Click one of the tabs at the top of the screen and you can quickly view the dialer, the call log, or your favorites (contacts you've dialed most recently). The dialer interface itself is a touchpad keypad with oversize, slightly overlapping keys. I found the keypad reasonably easy to use, and certainly less arduous than typing on the virtual keyboard. The music player in Android 1.5 is fine, but I had a lot of trouble getting music to load onto the DSTL1--in fact, I ultimately failed. I plugged the DSTL1 into my Dell PC (running Vista) at work, but the PC refused to recognize the device in Explorer. You may have better results. This problem also prevented me from loading any other kind of data onto the device, such as documents, images, and videos. The included headphones sounded okay, but you can't plug them (or any other headphones) directly into the DSTL1 because it has no 3.5-mm jack; instead, the headphones plug into a clip-on voice mic, which in turn plugs into the USB port on the phone. The DSTL1 comes with a 5-megapixel Sony camera that has an impressive range of features, including auto focus, facial recognition, choice of picture sizes, a timer for taking your own picture, and multiple focus settings. The DSTL1 also provides a physical button on top of the camera for shooting pictures, which I much preferred to snapping photos with my shutter-buttonless Palm Pre. The pictures I took with the DSTL1 looked good. The images were sharp, and the flash seemed to light photos properly without washing them out. I shot a 40-second video with the device, too; the output looked okay, but was limited by the phone's mediocre screen. The DSTL has some solid features (in particular, the dual SIM cards and the camera), but I wouldn't pay such a high price for a device with so many shortcomings. I do like the look and feel of the Android operating system, and I believe that the set of applications that are available to it will eventually best the set offered for the iPhone. But on the DSTL1, the hardware got in the way of making full use of the Android goodness. Still, for the moment, if you have a special need for dual SIM and Android in one phone, the DSTL1 is pretty much your only option. The General Mobile DSTL1 smartphone offers all the great features of Google's Android operating system, but it has some major hardware flaws.